“Il Ciocco” is a venue unique for the particularly rich vegetation that offers the traveller a true natural sight, embellished by the enchanting cornice of the hills and mountains. In these places where nature and art, legends and traditions admirably merge, you can see amongst chestnuts and thick rays of sunshine, small villages where time seems to stand still. The Resort is located within a park of 600 hectares, even if inside the greenest and uncontaminated Tuscan nature it’s only one hour distance from the beautiful touristic cities of Lucca, Pisa and Florence. Dream setting, fantastic food, fabulous vistas, excellent food and highly recommended Hotel so….Thank you Francesca and Terry!!! Thanks also to the the Hotel staff and to Silvia and Ketty of Infinity Weddings, due to their precious job all is perfectly managed. 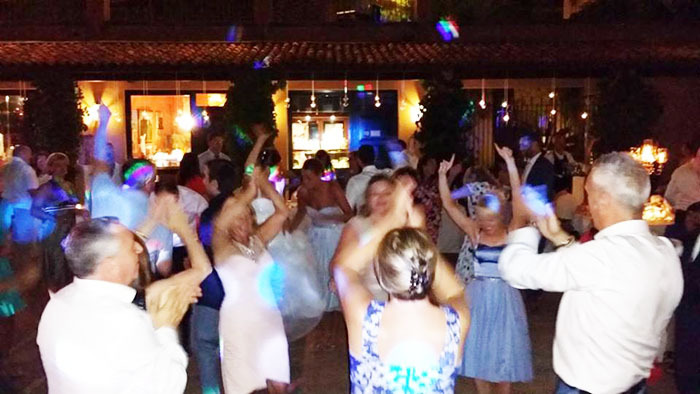 Guty & Simone Italy wedding band and DJ perform suddenly after dinner in the main square “La Piazzetta” that can hold up to 250 persons, they play a selection of International and Italian hits and everybody keep on dancing all the evening!!! As you can see, included in the playlist of the wedding party, there’s amazing tunes such as “Everything” by Michael Bublè, “Happy” by Pharrell Williams, “Don’t stop me now” and “Crazy little thing called love” by Queen, “That’s Amore” by Dean Martin, “Everybody needs somebody” by The Blues Brothers, “Tu vou’ fa’ l’americano” by Renato Carosone, “Get Lucky” by Daft Punk, “Jailhouse Rock”” by Elvis Presley etc.. a mix of songs of different genres and countries and from different times that can satisfy all musical taste.